The Allahabad High Court in a judgment [dated 5.11.2016] held that personal laws, of any community, cannot claim supremacy over the rights granted to the individuals by the Constitution. A division bench of the Bombay High Court set aside two orders of the Debt Recovery Appellate Tribunal (DRAT). The bench of Justices SC Dharmadhikari and BP Colabawalla pronounced the judgement in a petition that sought the orders by DRAT to be set aside. The division bench of Justice VM Kanade and Justice NutanSardesai of the Bombay High Court granted interim relief to Shirin Dalvi ex-editor of Awadhnama, by ordering the Mumbai police not to file a chargesheet against her. Awadhnama an urdu daily, was forced to shut down after it published the controversial cover story of French satirical magazine Charlie Hebdo featuring a cartoon of Prophet Muhammad on January 17, 2015. The High Court asked the Reserve Bank of India to file its reply regarding payment of salaries to school teachers working in aided schools. Since these salaries are disbursed by co-operative banks. This direction came while the bench of Justices AS Oka and AnujaPrabhudessai were hearing a bunch of petitions filed by District Co-operative Banks(DCBs). The Court directed the Maharashtra government to install video conferencing facilities in all courts in the state by the end of March 2017. These directions came while the division bench of Justices VM Kanade and NutanSardesai was a hearing a criminal PIL filed in 2011 after court took suo-motu cognizance of a letter written by Shaikh Abdul Naeem, one of the accused in the Aurangabad Arms Haul case. A full bench of the High Court held that a Hindu can marry 90 days after his/her marriage has been dissolved through a decree, provided no appeal is pending against the decree. The primary question before the full bench comprising of Justice Naresh Patil, Justice RD Dhanuka and Justice Sadhana Jadhav was that whether an appeal under Section 19(1) of the Family Courts Act, 1984 will be governed by the period of limitation prescribed under Section 19(3) of the same act or Section 28(4) of the Hindu Marriage Act, 1955. In Sudhir Singh and Another vs. State of Maharashtra and Another, the Court rejected the anticipatory bail applications of directors of Taj Pharmaceuticals, for the offence of cheating, forgery punishable under IPC, selling or providing goods and services with a false trademark punishable under Trade Marks Act, 1999 and Section 13(3)(a) of the Drugs and Cosmetics Act, 1940. A full bench of the Court held that the six-month time period prescribed for production of a Validity Certificate issued by the Caste Scrutiny Committee under Section 9A of Maharashtra Municipal Councils, Nagar Panchayats and Industrial Townships Act, 1965 is mandatory and in case of failure, the election of such individual will be terminated retrospectively and he/she will be disqualified. In a recent judgment, the Calcutta High Court held that part payment of a legally enforceable debt cannot defeat the entire cause of action in a dishonour of cheque case under Section 138 of the Negotiable Instruments Act. The Delhi High Court imposed an exemplary cost of Rs. 3 lakh on a person who had filed successive writ petitions on the same issue, for getting earlier admitted writ petitions heard. 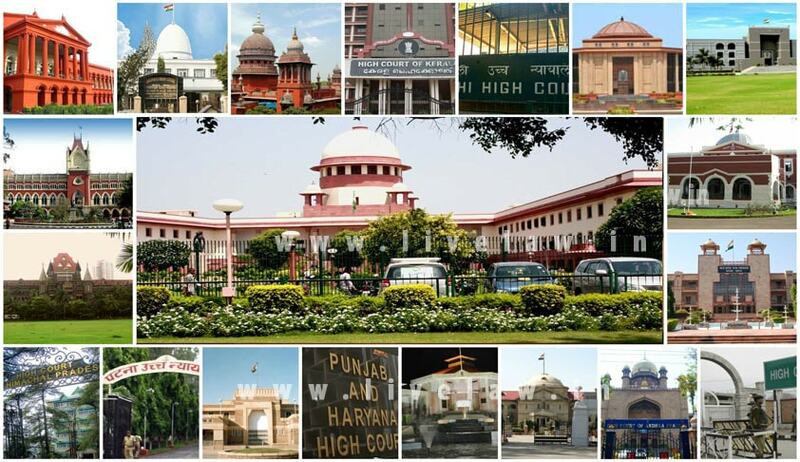 In a rare verdict in Jai Bhagwan vs. State of Delhi, a division bench of the High Court, speaking through Justice Gita Mittal and Justice Anu Malhotra, quashed and set aside a lower court’s judgment that held the petitioners guilty for commission of offences punishable under Section 498A and Section 302 read with Section 34 IPC and sentencing them to undergo rigorous imprisonment for life and to pay a fine of Rs. 3,000 each, and in default to further undergo rigorous imprisonment of six months for the commission of the offence under Section 302 read with Section 34 IPC and rigorous imprisonment for three years and to pay a fine of Rs. 2,000 each, in default of payment of fine to further undergo rigorous imprisonment of four months each for punishment under Section 498A, to run concurrently. Rejecting the plea of a widow of freedom fighter, the High Court in Harbhajan Kaur vs. Union of India, held that the Government of India (GoI) has no obligation to raise a dispute with a foreign government in relation to the private claim. In Rajiv Chhikara vs. Sandhya Mathur, the High Court dissolved a marriage finding that the matrimonial bond was beyond repair. The parties got married in March 12, 2004, but their relations became sour soon. Wife Sandhya had filed a petition for divorce under Section 13(1)(ia) of the Hindu Marriage Act, 1955 (HMA), alleging that there has always been a demand of dowry from her husband and that he took away all her money, used to lock her in the room before leaving for his job, beat her and ridicule her before his friends. In a landmark judgment, the High Court directed trial courts to ensure that the identity of the victim in cases involving sexual offences shall not be disclosed anywhere on judicial record and that names shall be referred to by pseudonyms in accordance with law and they be so identified during the course of trial and in the judgment. The Court, in Jatinder Kumar Sachdeva vs. The Union Of India And Ors, clarified that when goods are seized/confiscated, the Customs Department must give a show cause notice under Section 124(a) of the Customs Act, 1962 (the ‘Act’) within six months or within the extended period of further six months, otherwise the goods have to be released to the person from whom they have been seized. A division bench of the Court in a swinging and exceptionally quick judgment in appellate proceedings of what is popularly known as the DU Photocopy case, set aside the order passed by the Single Judge Justice Rajiv Sahay Endlaw and restored the trial on 2 key factual aspects. A lot of ink has since flown in a short span of two days giving both bouquets and brickbats to the judgment. What is important here is that the bench said that there was no triable issue but gave 2 factual aspects to the appellants; Disposed of the appeal but restored the trial and refused the interim injunction. A division bench of Kerala High Court stayed an order of Sree Padmanabha Swamy Temple executive officer issued recently granting certain relaxations regarding the dress code for women to enter the Thiruvananthapuram temple. The Madhya Pradesh High Court (Gwalior) in Kunaldev Singh Rathor vs. State of MP and Ano, quashed criminal proceedings against applicant Kundaldev by exercising its power under section 482 of the CrPC as allegations by his wife (complainant) were absurd and were levelled to make the case more grave. The Rajasthan High Court quashed a notification dated 16th October, 2015, issued by the state government and Rajasthan Special Backward Classes (Reservation of Seats in Educational Institutions in the State and of Appointments and Posts in Services under the State) Act, 2015, which provided 5% reservation to Gujjars and four other castes under the Special Backwards Classes (SBC) category.